Astute readers may have noticed a few guest writers showing up recently here at Out West Arts. It's been a bit of an experiment for me, since this place has always been primarily a site for my own thoughts and views about performance that I've experienced first hand. But Out West Arts has also been very much about all the great and varied music and theater in Los Angeles and the West Coast as well and frankly, try as I might, I'm only one man. So starting with this post I'm going to be welcoming a variety of new contributors to Out West Arts in addition to myself who are going to be my eyes and ears, and perhaps yours as well. So let me start by welcoming another new contributor - chorus master, man-about-town, and all around great guy Dan Keller to the OWA family with this post. I hope you enjoy reading him and other OWA contributors that will be joining me as much as I do. Stile Antico, winner of the 2009 Gramophone award for early music for their Harmonia Mundi recording Song of Songs, performed last Wednesday April 18 to a full house at St. John’s Episcopal Cathedral in Los Angeles. The concert, entitled “Treasures of the Renaissance,” featured sacred polyphonic music from the Renaissance, plus one recently commissioned work by John McCabe. The conductor-less twelve-voiced ensemble stood in a semicircle reading from hand held scores. 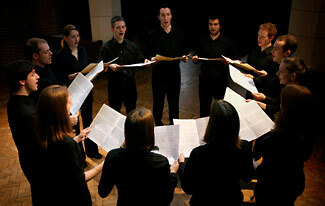 This approach, though straying from the Renaissance practice of singers gathering around a single music stand to read from part books (a technique recently revived by early music groups such as Capella Praetensis), resulted in a remarkably nuanced interpretation of the music as a result of the visual energy between singers. They sang with impeccable tuning throughout, and an impressive attention to detail, particularly when unifying the articulation of the texts. The gems of the concert were Clemens non Papa’s “Ego flos campi” and an encore performance of Campion’s “Never weather-beaten sail” featured on the group’s latest Harmonia Mundi recording Tune thy Musicke to thy Hart. Contrasting dynamics and delicately tapered phrase endings highlighted changes in mood in both pieces. Most striking was the way in which the group proceeded from collective breath points—allowing the tempo to pause briefly so that the reverberation could more fully decay in the vast acoustical environment of the Cathedral. Several of the pieces performed featured as many as twelve parts, among them Tomkins’s “O praise the Lord” (also featured on their newest recording), and Praetorius’s polychoral “Tota pulchra es.” In the case of the Tomkins, the individual voices were allowed to stand out as a vehicle for expressing the complex counterpoint. In the Praetorius they took further advantage of this variety by grouping voices by timbre into three quartets standing at a distance apart on stage. The contrast in tone between each quartet enhanced the antiphonal setting of the text. Despite this cohesion, or perhaps because of it, parts of their performance suffered from a lack of forward motion. In the case of “Magnificat primi toni” by Gombert, whose style is notorious for its uniform texture, one might forgive the occasional stasis. But in “Veni dilecte mi” by Lassus, whose music is full of tonal ebb and flow, the lack of distinction between phrases left the performance a bit flat. The group sang from a variety of editions, both scholarly and otherwise (apparently including some from the online choral public domain library), which meant that several pieces might have been transposed to a higher pitch level than originally scored in order to accommodate female sopranos and altos. (Boy sopranos and adult male countertenors would have been standard during the Renaissance.) The added power of the women’s voices in the higher range resulted in occasional treble-dominated passages that were incongruous with the otherwise flawlessly balanced sound. While the chosen repertoire was fitting given the program’s title, it likewise suffered from a lack of stylistic diversity. A bit of relief was provided by John McCabe’s “Woefully arrayed,” a 2009 setting of a sixteenth century text attributed to John Skelton. This work, reminiscent of Pärt and Tavener, is an ingenious nod to Renaissance polyphony within a modern harmonic framework. Here the talents of the group were fully exploited. They provided the widest range in dynamics and articulation of the evening. They also took full advantage of the textual imagery by emphasizing dissonances and changes in rhythmic density. Overall, the group provided a solid performance. They interacted musically as a chamber ensemble, allowing for a degree of spontaneity. Rather than presenting the repertoire exactly as it occurs in their recordings, they reacted to the performance environment—a refreshing change from the too often over-rehearsed approach to choral music. 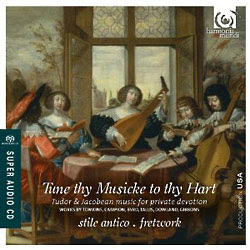 Furthermore, the members of Stile Antico engaged with the audience in a way that displayed their fondness for the music. This in turn elicited an equally enthusiastic reception.